This paleo apple cake is super moist, full of fall flavor and made with a blend of almond and coconut flours for the best texture. Topped off with an amazing caramel fudge frosting! I absolutely love this time of year. And I love that there are apple trees all around our apartment and around town that are free to be picked . This means we’ve got a lot of apples sitting around. Apples that are just waiting to be baked into something delicious! 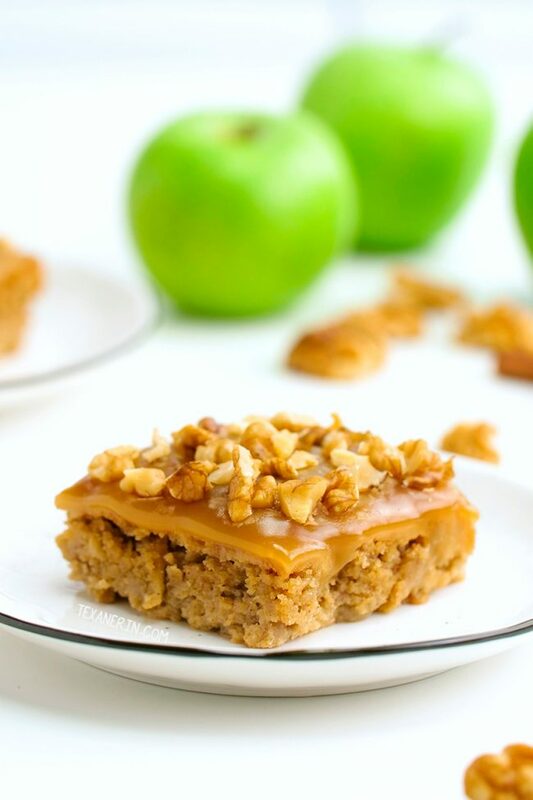 So far, I’ve made my Swedish apple pie, this gluten-free apple crisp and I’m excited to try this overnight baked apple oatmeal recipe. But this paleo apple cake was the first thing I made this lovely apple season! It’s super moist and loaded with cinnamon. The first time I made it, it wasn’t apple-y enough for me so there’s some grated apples in there for extra apple flavor. Before I tried that, I looked at other paleo caramel frosting recipes and they were too complicated. Like making caramel first and then using that as an ingredient in the frosting recipe. I really doubt that any regular frosting recipe could be more delicious than the one in this recipe plus it’s the easiest way so I consider it a win-win! The “frosting” on this cake is kind of like a cross between fudge and caramel. If you want something more frosting-like, try the maple cream frosting I used for my paleo pumpkin cake. It would be perfect on this cake! If apple isn’t your thing and you’re already loving all things pumpkin, this paleo vegan pumpkin pie, these paleo pumpkin muffins, or these gluten-free pumpkin cupcakes are some of my reader favorites! Mine, too. Questions about this paleo apple cake? 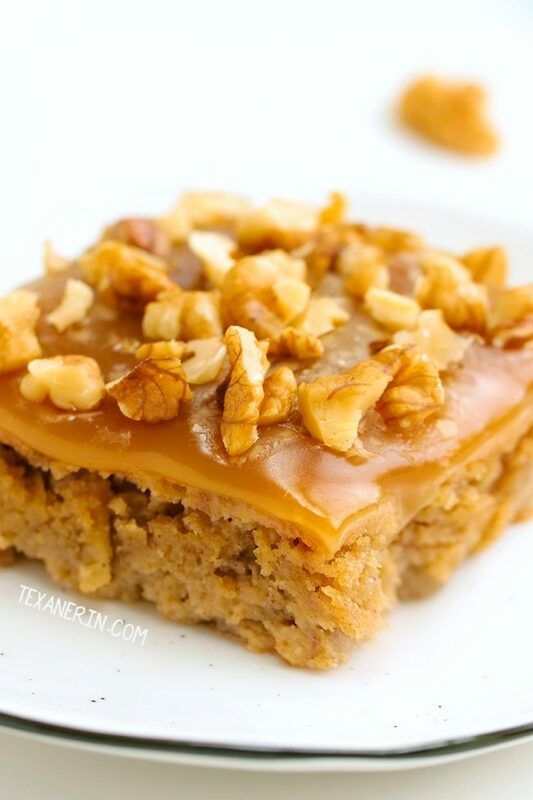 If you have questions about the frosting, please check out the questions section at the bottom of my caramel fudge candy recipe. What can I use instead of almond flour / coconut flour? You could use another type of nut flour or meal for the almond flour but there’s no sub for coconut flour and you unfortunately can’t just omit it. It absorbs much more liquid than other types of flour. 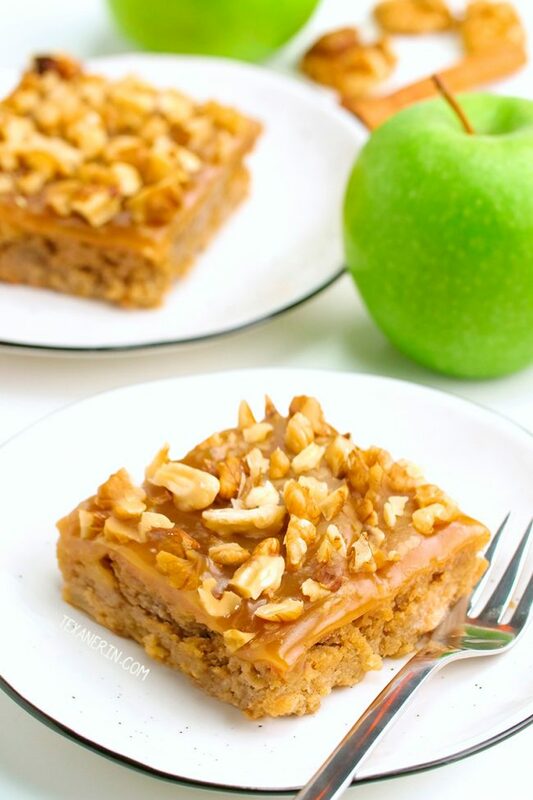 If you want to use a gluten-free 1-to-1 baking flour or whole wheat flour, you have to try my caramel apple cake! What can I use instead of eggs? I’ve tried making this cake vegan several times with chia eggs and an egg replacer. I wasn’t successful. Grain-free cake recipes like this one can sometimes be finicky when it comes to subbing the eggs. Do I have to use grated apples? Yes. It adds sweetness and moisture. The cake is too dry without it (in my opinion!). Can I use a different sweetener? I’ve tried this apple cake with honey and maple syrup. Another liquid sweetener would probably work. Preheat the oven to 350°F (175°C). Line an 8"x8" pan with a sheet of parchment paper. In a large bowl, mix together the eggs, oil, maple syrup, and vanilla. Add the dry mix to the wet and mix just until combined. Gently fold in the grated apples and then the chopped apples. Pour the batter into the pan and bake for 20-24 minutes or until a toothpick inserted in the middle comes out clean. Let cool completely before frosting. In a small saucepan, mix together the maple syrup, cashew butter and coconut oil over medium heat. Add salt, if using (starting off with 1/8 teaspoon and adding more, if needed). At first it might not appear to come together well but be patient. Stirring constantly, bring to a boil and while continuing to stir constantly, boil for about 2 minutes. It should have thickened a bit and become glossy. If it hasn't, boil for up to another minute. If you use a heavy bottom pan, you may need to boil it a little longer. Stir in the vanilla until well combined. Let cool about 5-10 minutes and then pour over the cooled cake. Top with chopped nuts, if desired. Store the frosted cake in the refrigerator for up to 3 days. 29 comments on “Paleo Apple Cake (gluten-free, dairy-free, grain-free)” — Add one! I’m wishing for this tasty cake for Valentine’s Day. Looks amazing! Love that you used coconut sugar! I’ve been trying to find more ways to use it :) These look so delish, perfect for parties! There are so many great uses for it! This looks delicious and seriously the only thing I’m missing is cashew butter! I know this will be a crowd pleaser – YUM! This looks simply amazing! 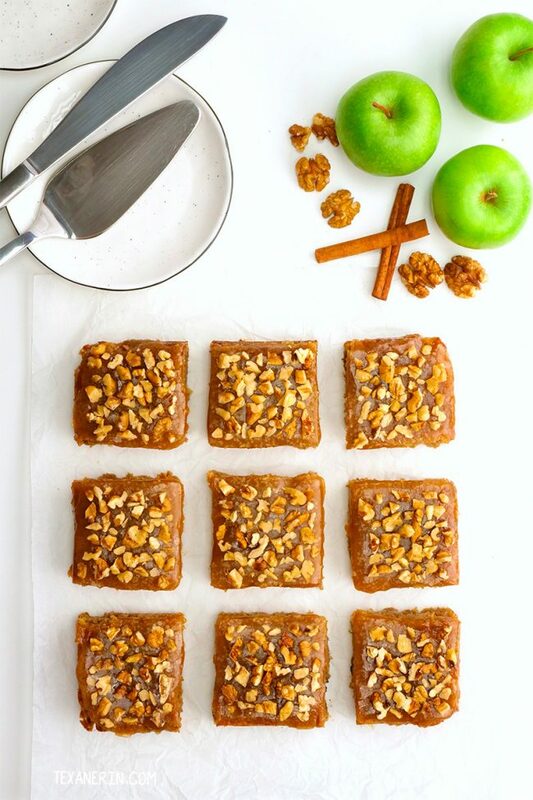 Craving all things apple and cannot wait to make this as soon. I followed the recipe but the middle didn’t want to set up. I had to add another ten or so mins just to get it to firm up enough, but it still sort of collapsed. Any suggestions on getting it to set up better in the middle? No substitutes and baked in a sqare 8×8 metal pan (light color), and oven works fine. I think it only collapsed because of the added weight of the frosting, but the middle would not firm up and was still all jiggly before I added extra time. A friend suggested it could be the almond flour – do you use the extra-fine almond flour for baking? It was definitely tasty so will need to try again, maybe with the extra-fine flour. Hmm. I’ve used both extra-fine and regular almond flour but didn’t notice a difference with this recipe. I’ve noticed a difference in the final results with cookies, but not with cakes. But it’s worth a try! Sorry I can’t be more helpful. This cake is DELISH! Wish it made a 13×9. Was also wondering about the measuring amounts. 1 3/4 C almond flour is only 2 T away from 2 C. Much easier to measure. So is 7 1/2 T of coconut oil. (1/2 C). I just rounded everything up and it turned out fantastic. (3/8 of a t of salt???) Just seems a bit odd to me. lol But I do LOVE the cake! I’m so happy you enjoyed it! You could double the recipe and that’d likely work well in a 13″x9″. :) I use grams when measuring and tested this recipe 10+ times to get it just how I wanted it. Hence the measurements. ;) Thanks for your comment! I made this cake this weekend and we do love it, especially the addition of the delicious frosting. BUT, one concern I have is what is the best way to remove pieces of the frosted cake? I find that after it is refrigerated it is difficult to remove a piece without it breaking into pieces. It is super moist and the parchment gets quite soggy. Any suggestions? Hi! I’m happy you like it. :) You mean the cake breaks into pieces or the parchment paper? I’ve had the soggy parchment paper problem with different brands and just switched (but I live in Germany so what brand I use isn’t helpful). I can’t think of a very good solution. :/ Just cutting it into pieces and then refrigerating, which definitely isn’t very convenient. You could also oil the pan instead of using paper (if that’s what the problem was). Sorry I can’t give you a better answer! Will almond butter work in place of cashew butter? I can’t have cashews. And thanks for no sugar substitutes! Can’t do those either and both maple syrup and coconut sugar have their own health benefits. This looks amazing! You can! :) I took this from the questions section of the frosting post: “What can I use instead of cashew butter? I’ve made this with peanut butter (for a non-paleo version), almond butter and sunflower seed butter for a nut-free version. If you use almond butter, it won’t taste caramel-like at all. But it’ll still be yummy (although I think some added cinnamon would be a good idea! ).” I hope you’ll enjoy the cake! I’d love to hear how it comes out. Love this apple cake! Craving for this! WOW, that looks incredible, I can’t wait to try it! I am swooning over the frosting in this cake! Wish I had a slice right now! Will be great to have this Apple Cake on hand this week! Yum! Wow, this sounds so perfect for fall! That “frosting” is making me drool! I love apple cakes! This cake looks so delicious and moist! Perfect for the season! Oh yes, apple recipes for me. Never ready for pumpkin until late Oct. or Nov. It looks yummy! Wish it was low carb. HA!! If we could use granulated lakanto (monk fruit or erithrytol) it would be better than maple and honey that have too much sugar and carbs. I love your attempt at better health baking.